In this specific case, mobiles are a great option for organizing work along the country’s borders, and to an extent within, but additional strategies are certainly needed. In a country with such abject levels of technology access (less than 1%), a lot of work that is done inside the country is done so through the old-fationed technique of writing with pen onto paper. There are several problems with this method. One is efficiency. Take one sample survey which takes over 150 files, each with 100 columns holding 1-3 digits. Not only does this need to be recorded, but then databased in a computer. The land between where the information is documented and the safe office to do so can be more than a weeks travel by foot. This brings in several of the other issues, including danger to the files (rain, pests, etc) and more importantly, danger to the individuals carrying them (weight, persecution, etc.). Altogether, when successful, this process can take 6 months. Successful documentation relies on reliability, timeliness, advocacy. All of these are negatively impacted due to these conditions and so I’ve been seeking to think strategically about ways to alleviate these concerns. Visualizing data can be part of what negatively impacts the reliability of information beyond the problems one encounters in the process of documentation. Once it is collected, wet conditions lead to pages bleeding into one another, thus making them more difficult to read. The lack of metadata makes it difficult to confirm questions if any arise. Where were things documented, when, and in what order can be confused as stacks of paper pile. With different people writing and processing the information, handwriting can often be an indecipherable block to the process. The time crunch for data to be processed can be extreme. Reporting can lead to increased funding and support. A lack thereof can have opposite effects. Funders expect fast turnaround on projects. Timeliness can be a large factor in priorities, for instance, after a disaster and the needs that arise and need to be understood. Coordination also falls prey to this as different organizations need to be in communication with one another to understand the context of the work that each other are doing in order to leverage that knowledge, rather than reinventing what has already been done. Plus, those documenting are often putting their lives at risk to do so. Yet their carrying stacks of paper which are heavy and slowing, but also put their lives at risk. Evasive maneuvering is an additional burden that they have to endure. Advocacy is connected to these other two points. Actionable information has to be based in truth but it also benefits from being prompt. Responding to an abuse that has happened 1 year ago is different than one from 1 minute ago. The type of documentation also helps correlate to impact. Choosing the medium of whether to record visuals, audio, or text and the narrative of personal stories, abstract questions, or psychoanalysis can be quite different as well. Many of these issues can be overcome with documentation directly on mobiles and it is exciting to be part of this emerging field. The other winners at the conference are a few good examples of this: Guardian, Freedom Fone, Bug4Good. I recently came across a project that I believe can be a powerful alternative in places that mobiles can’t go – a smartpen. Livescribe has recently come out with a digital pen that is inconspicuous, durable and reliable. It records what it writes into its internal memory, creating PDFs from each written page of text from the special pixelated paper on the notebooks it comes with. It records audio, has native programs such as a calculator, translation tool and a piano (just for kicks) and is even programable with an available software development kit. What am I most excited about? After recording sensitive information, users can set fire to the paper to get rid of the evidence (or use any preferred secure method to do so). The information is still backed up as a PDF on the pen itself. As long as people can dispose of the paper but keep the pen safe, many obstacles are overcome. I see a huge opportunity to take this tool further by creating programs that leverage its ingrained potential with the needs that I’ve found groups to have on the ground. What I’d like to do as the next steps is to make the questionnaire that I’ve included below into one whose data can be quickly processed into a spreadsheet by a computer reading from forms. In terms of next steps for the Handheld Human Rights project, this is certainly one way to increase functionality and breadth while hopefully saving lives. New technology does mean confronting new issues and this case is definitely included. There are many improvements I’d like to see with the smartpen and many directions such a young project can go, but in the meantime, it’s my “magic pen” and I’m going to continue to jot notes with it as I continue to test the limits of its field functionality. Hi Mark, this is really great idea…I hope you can make this happen. I think LiveScribe was supposed to introduce handwriting recognition. I will check for more info. 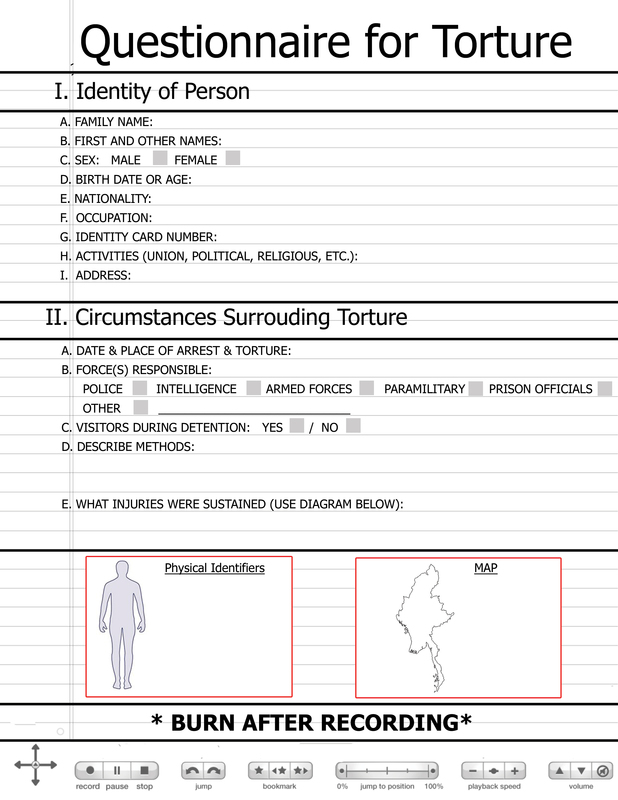 In any case, having a preprinted livescribe book with the fields required for data collection that correlate with a spreadsheet would be totally cool and even useful beyond the needs of the human rights community. Thanks Juliana. It was the initial conversation with you that sparked this idea. It’s been great to engage in conversations since that as it really seems to be something that can have a huge impact in the field if deployed properly. I’ve spoken with the company and there are options for this, some of which can be done now, some that depend on their development schedule. To add another level of security, one does not even need to preprint. Plastic overlays can do the trick, plus can be more durable, economical, and environmentally sound.